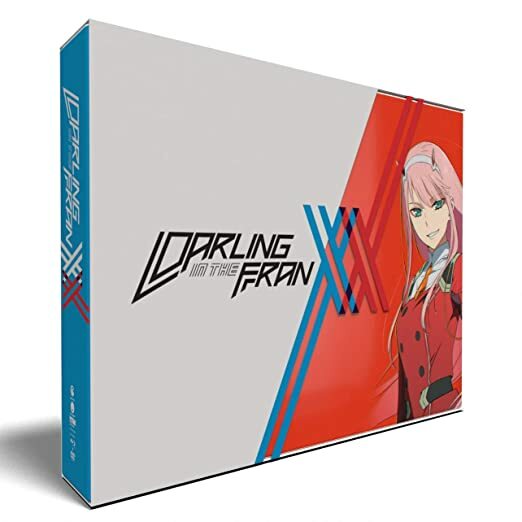 Darling in the Franxx: Part One - BUY THIS BLU-RAY! It started with a kiss from the mysterious girl that called him…darling. In a battle against deadly beasts known as klaxosaurs, only the children, classified as parasites, are humanity's hope in this dying world. Fighting in mechanized suits known as FRANXX, parasites are grouped up in male and female pairs to face the monstrous creatures. Hiro, Code 016, was once a prodigy FRANXX pilot. But right when he gives up the fight, he meets Zero Two, the girl with the horns, and finds a new reason to keep going. But working with Zero Two has its own troubles. Known as the partner killer, no one has survived more than three battles with her. Still, she's determined to prove that Hiro is her match—her darling. Will the pair become the saviors of this desolate world, or is there something more dangerous than klaxosaurs awaiting them? THEN SEND IN A COMMENT ABOUT YOUR FAVORITE FUNIMATION TITLE (you may click on artwork above for a refresher) PLUS YOUR NAME AND ADDRESS TO contests@efilmcritic.com or WeLoveHBS@aol.com. (Just one e-mail please.) Put [b]"FRANXXLY MY DARLING I DON'T GIVE A DAMN" in the subject line and cross your fingers. We will draw names and one of the prizes could be yours. Only 1 entry per household.